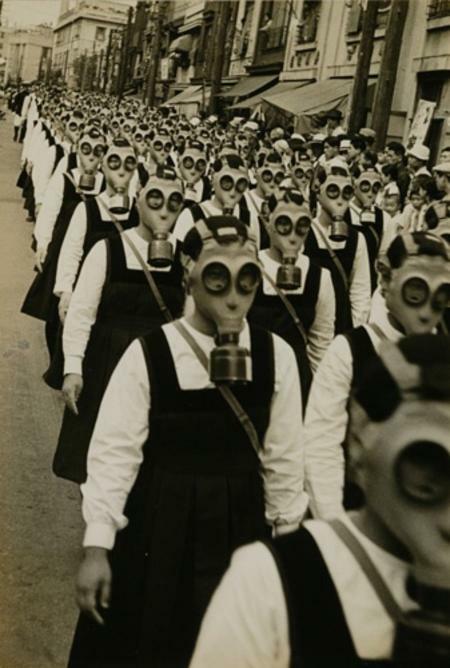 In the end it was decided the girls would get the gasmasks. As in, only the girls. I don't know exactly how the teachers came to the conclusion that that was the most logical thing to do. They huddled together in a corner around the coffee maker until one of them turned around and yelled out The girls! That teacher’s name was Mrs. Takatama, I think. She was a mousy lady but she managed to make the announcement sound, somehow, triumphal, especially considering the announcement that had just come over the city wide PA-system. As if decisive blow had been dealt in a war that was old enough to have children and grand-children. She taught maths, I think. I'm not sure. Must have been in one of the higher years. Soon a line formed in orderly fashion. A palisade of identically dressed girls lined the airy assembly hall, sorted mostly by age and, as a consequence, by height, with the younger, smaller girls (whose attention the teachers thought most likely to wander off) in front and the older girls bringing up the rear. Here and there discipline broke down, but only a little. The occasional sobbing kindergarten kid was allowed to hang on to their patient big sisters’ skirt hems while the straps of their masks were adjusted by a teacher whose creased, orange sash proclaimed a Level III proficiency at Tactical Preparations. Together with the other boys I was coraled around the stacked lunch tables in the center of the room. Otohiro, who was a year below me but who I knew well from extracurricular swimming lessons, surreptitiously handed me his tin pen case. He looked around, ever vigilant, but no one else seemed particularly interested in his latest secret. After an almost invisible nod I opened it. There was a bright green frog inside, dead as a doornail. I nodded in return. That was a fine dead frog, alright.